The photo exhibition was organized by the Agence Artistique Girard. 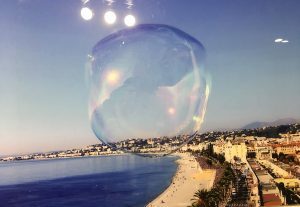 In a beautiful space facing the Mediterranean Sea in Ajaccio, birthplace of the great Napoléon Bonaparte, the photos and poems of the artist from Nice, Khaled Yourself was on display. In almost all the pictures, there was some sort of bubbles. His poems were also on display and the visitors had a chance to watch both words and images at the same time and find out about their relations and how words and images can make our life more interesting and more understandable. The photographer had captured the short moment of bubble’s life. In the background there were a variety of children from different countries. There was no captions for the photos and that made the visitors to speculate on the whereabouts of each image. The organizer, Stéphanie Girard explained that the artist on purpose deleted the captions to give a sense of the universality to each image. But our reporter insisted on the necessity of captions. 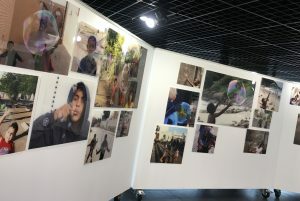 The powerful image of this boy from Turkey was the highlight of the exhibition. His eyes and facial expressions say it all. 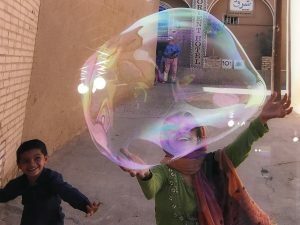 The following picture had been taken in rural area of Iran. 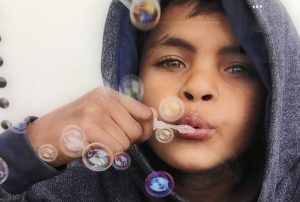 It shows how the innocent children following the bubbles. 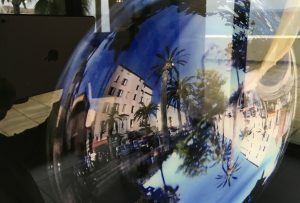 The variety of pictures taken in cities of Nice, Menton, Ajaccio and other Mediterranean cities. It was an interesting exhibition, especially mixing poetry with the image. The artist is both: a poet and a photographer. According to the artist, “poetry has a magical quality” that influencing the souls and photography has a universality that the visitors from any culture speaking any language can connect with it, understand it and appreciate the message it conveying.